National Testing Agency (NTA) is likely to release the JEE Main 2019 Paper 2 result soon on its official website. Some of the reports suggested that the JEE Main Paper 2 scorecard 2019 will be declared on Thursday, January 31. The scorecard for JEE Main Paper 1 was declared on January 19, 2019. The JEE Main January examination was held from January 8 to 12, 2019. Around 11 lakh candidates had registered for the JEE Main January 2019 exam. The NTA will release the JEE Main January 2019 Paper 2 scorecard on the official website of the exam - jeemain.nic.in. The candidates who had appeared for the Paper 2 of JEE Main Jan 2019 exam are advised to visit the official website to check their scorecard on it is officially released there. The candidates will have to enter their application number and password or application number and date of birth on the official website to check their JEE Main scorecard 2019. JEE Main is a national level engineering entrance examination conducted by NTA. Starting from 2019, the JEE Main exam will be held twice in a year - January and April. The candidates who want to appear for the JEE Main April 2019 exam can visit the official website for registration. The registrations for April session will commence from February 8 and the examination will be conducted from April 6 to 20. JEE Main is held in the computer-based test (CBT) mode in various shifts per day. The first JEE (Main) Examination was conducted by NTA between 8th and 12th January, 2019 in two shifts per day across 258 cities in the country and abroad. 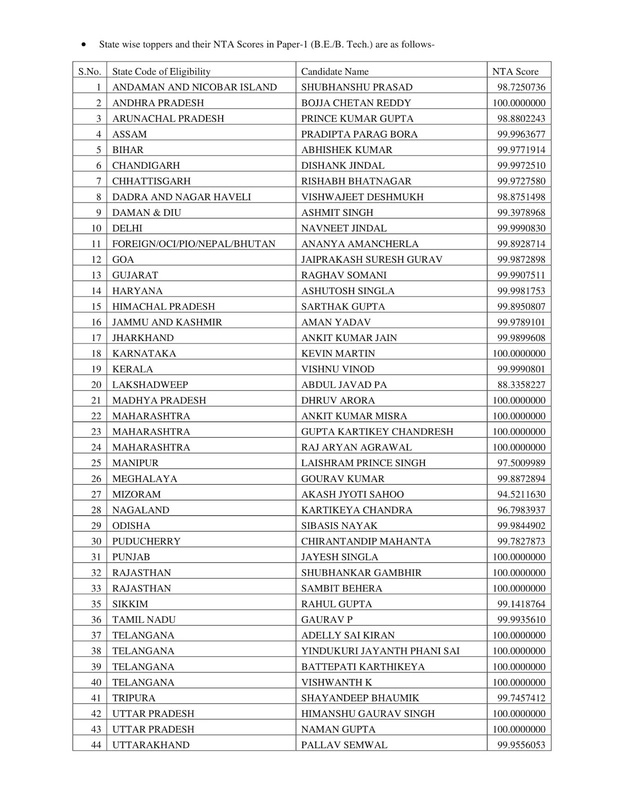 A total number of 9, 29,198 candidates were registered for Paper â€“I (B.E. /B. Tech.) in this examination. There were 467 examination centres across the country and abroad. A total number of 566 Observers, 254 City- Coordinators and 25 State Coordinators were deployed at these centres to oversee the smooth and fair conduct of examination. The Paper-I was conducted in a total of 8 shifts from 9th to 12th January 2019. The results of Paper- I have been declared today. Joint Entrance Examination (JEE Main) 2019 result is likely to be released by the end of January 2019. The last date to raise objection and challenge the JEE Main 2019 answer key for January examination closed on January 17, 2019. The JEE Main result 2019 would be available in online mode only and wonâ€™t be dispatched to candidates. As per the official notification released by NTA, the JEE Main 2019 result for January examination is expected to be announced by January 31, 2019. However, National Testing Agency (NTA), may announce the result earlier than expected. Some reports suggest that the JEE Main 2019 result may be declared by January 23, 2019. However, there has been no official information available on these dates.The candidates are advised to visit the official website of JEE Main to check result date. The students who have appeared in the JEE Main 2019 exam should note that NTA will announce only scores of the candidates in January. The JEE Main 2019 Ranks, however, would be released only after JEE Main 2019 April exam. Only the score obtained in JEE Main 2019 paper 1 or paper 2 is included while releasing JEE Main Rank list name wise. 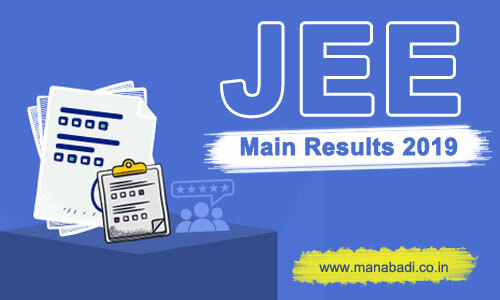 The result of JEE Main 2019 also shows whether the candidate has qualified for JEE Advanced or not, subject to meeting other eligibility criteria. Marks obtained in Paper 1 = Number of correct answers x 4 â€“ Number of incorrect answers x 1. Marks obtained in Paper 2 = Number of correct answers in Maths and Aptitude Test x 4 â€“ Number of incorrect answers in Maths and Aptitude Test x 1 + marks obtained in Drawing Test. Step 1: Visit the official website of NTA or JEE Mains to check result of JEE Main 2019. Step 5: Save and download JEE Main result 2019 and score card for future correspondence. Total NTA scores obtained in first attempt. The rank of JEE Main 2019 will only be determined on the basis of marks secured in the examination. For each correct answer 4 marks will be allocated to the candidates. For marking incorrect response, 1 marks will be deducted. When all the questions will be checked, and marks will be allocated or deducted, the final score of the candidate will be determined. The CBSE will then determine JEE Main Cutoff, on the basis of various factors. As per it and the score secured by the candidates, merit/rank will be allocated. The actual scores of candidates in JEE Main 2018 will be used to determine the ranks of the engineering entrance test. Your rank will be affected directly by the score you secure in the test. This means that the higher your score, the higher will be your rank of JEE Main 2018. Also, if two or more candidates score equal marks, then tie-breaking rule or inter-se-merit will be applicable. The candidates can check the previous year official answer key of JEE Main provided in Manabadi website. The Joint Seat Allocation Authority (JoSAA) holds JEE Main Counselling and Seat Allotment for JEE Main and JEE Advanced candidates after declaration of JEE Main Result 2019. There is a maximum of six rounds. Candidates will be called on the basis of their ranks in the JEE Main Rank List name wise. There are 23 IITs, 31 NITs, 23 IIITs and 20 Other-Government Funded Technical Institutes (Other-GFTIs) participating institutes accepting result of JEE Main 2019. Candidates are allotted seats on the basis of their merit and availability of seats. Before the actual seat allotment, mock allotment of seats will take place in two rounds. This allows candidates to know the seat allotment process and this way, they will also be able to know and choose better preferences for themselves in the main rounds.